Sluggish economy, high bullion prices and consumer shift towards cheaper gifting options such as electronic goods and mobiles have taken the sheen off gold. Jewellery sales in India have declined by up to 70 per cent so far this wedding season, due to the overall slowdown in economic growth, high gold prices and the shift in consumer preference towards cheaper gifting options such as electronic goods and mobiles. While urban jewellers have witnessed intermittent purchases from occasional consumers in small denominations, rural sales have been impacted very badly due to a slowdown in agricultural growth and subdued farm income brought on by weak agri commodity prices. Most importantly, even occasional buyers are entering the shop either to redeem gold deposit schemes or to replace their scrap jewellery with new ornaments and pay the small differential. Normally, jewellers work on bridal designs throughout the year to lure customers during the wedding season. Which is why a number of new bridal collection ornaments were launched this season. “Such a drastic slowdown during the wedding season has never been seen before. "Even during the worst of economic slowdowns in the past, we have seen a booming time for jewellery sales during the wedding period. "While jewellery sales remained muted over the last one-and-a-half years, retailers are passing through a massive slowdown this wedding season. In some places, sales are down by up to 70 per cent,” said Ashok Minawala, partner, Danabhai Jewellers, a Mumbai-based century old jewellery retailer. Rural farmers, as a matter of practice, sell or mortgage their ornaments during sowing season to get them restored after harvesting the crops. This time around however, sustained weak realisations from farm produces has seen farm value chains experiencing rural distress. “Farm distress has affected jewellery sales this wedding season especially in rural India. 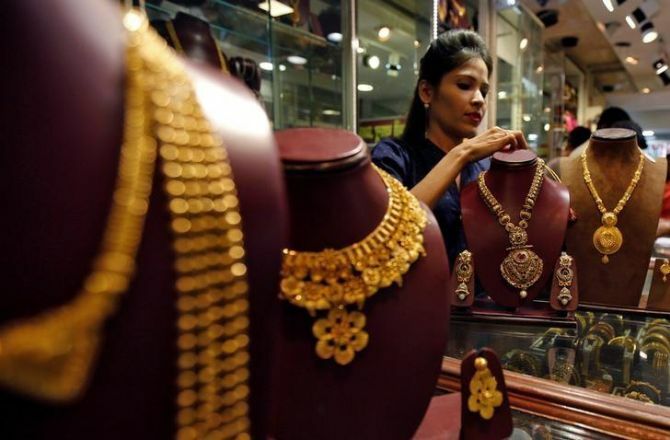 "Apart from that gold availability, high gold prices and high interest cost on working capital have hit jewellers’ capacity to hold on to inventory beyond a reasonable time. Also, slowing consumer appetite has impacted jewellery sales this wedding season,” said Shankar Sen, chairman and managing director, Senco Gold Ltd, a Kolkata-based gold and diamond jewellery retailers. Jewellery retailers have started discount offers to lure customers for the first time during the wedding season. While market leader Tanishq offers up to 20 per cent off on diamond jewellery, Tribhovandas Bhimji Zaveri (TBZ) charges a fixed Rs 249 a gram as making charge on gold ornaments now, instead of 10-15 per cent of the metal's value earlier. Kalyan Jewellers pushes its wedding collection through 50 per cent off on making charges along with an additional 18 per cent and 15 per cent discount in making charges on the occasion of Republic Day. Caratlane, a Tanishq partnership company, offers up to 15 per cent off on diamond prices to its customers. N Anantha Padmanaban, Managing Director of Chennai-based NAC Jewellers, believes the ongoing slowdown in jewellery sales has prompted retailers to clear existing inventory instead of adding fresh volume to store. Investors stayed away from active gold purchases perhaps due to negative or slow returns the past few years. Returns on rupee investments in gold have slumped the past few years, following global cues, after a decade-long double-digit growth ending calendar 2012 (barring calendar 2004). While returns were negative between calendar 2013 and calendar 2015, they were 11 per cent, 4.8 per cent and 8 per cent in calendar 2016, 2017 and 2018, respectively, primarily because of rupee depreciation.